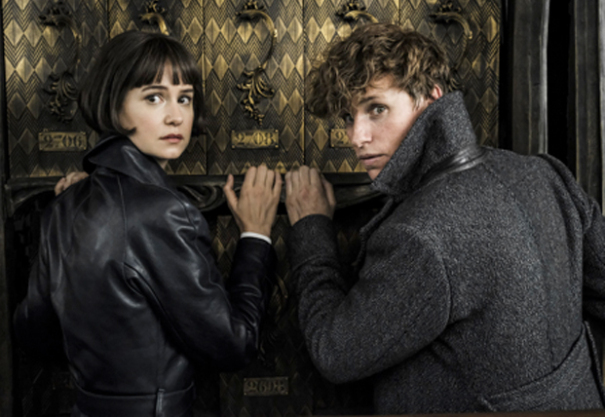 In an effort to thwart Grindelwald's (Johhny Depp) plans of raising pure-blood wizards to rule over all non-magical beings, Albus Dumbledore (Jude Law) enlists his former student Newt Scamander (Eddie Redmayne), who agrees to help, unaware of the dangers that lie ahead. Lines are drawn as love and loyalty are tested, even among the truest friends and family, in an increasingly divided world. Along with other returning faces from previous adventures Newt finds himself caught up in a fight he doesn't wish to be part of in order to simply do what is right. It’s easy to cast a cynical eye over the world of Fantastic Beasts. As I settled in my chair the adverts for Potter and Beast related Lego along with the alluring offer of trips to Potter’s World via theme park and movie set visits were loud and not subtle in their placement. Further cynicism might suggest that the Fantastic Beasts saga is simply an attempt to try and somehow compete against the Disney juggernaut that holds Star Wars and Marvel in its grasp before even considering its own output. Warner Bros are up against it, this feels like the only viable franchise contender they hold and they need to keep it going! In some ways this sums up the issues with The Crimes of Grindelwald. To be clear I enjoyed my time in this world again (mostly) but there was a tangible sense of being in the presence of a stepping stone. This may be a movie that is just about entertaining enough to get you to the next point in this winding, and at times, cumbersome tale. There is a lot of chatting in rooms about things that may or may not happen and their possible impacts. There is a lack of character development from the first installment and there a lot of new / familiar (albeit with different faces) characters to take in. At times there are almost too many moving parts inlay to fully engulf you into the film. Yet, when the action gets going and the beasts do appear it is hard not to get swept away in this wizarding world and if all else fails the uber cute Niffler appears to distract you from the elements that were causing you annoyance. I don’t want to be wholly negative about the film though as there are things to like. Eddie Redmayne’s gentle awkwardness makes Scamander incredibly charming and endearing. Jude Law is a decent Dumbledore, many were sceptical but he inhabits what little screen time he is given well and has potential to become the Dumbledore fans know and love. Johnny Depp also (despite the plaguing personal issues he brings) must be given credit for a strong performance as the antagonist Grindelwald, toned down and with quiet menace making the audience lean in to listen to his claims rather than shout loudly and wail like a pantomime Sparrow/Wonka villain, which many fans feared would be the case. The Crimes of Grindelwald is not a terrible film and while I am aware that many fans are displeased that it disrupts/destroys ‘canon’ in reprehensible fashion, I was (for the most part) suitably entertained and the final 20-30minutes certainly had enough magic, threat and intrigue to push it over the line into a recommendation. I can’t ignore the problems completely but ultimately, this is a piece franchise cinema and its not so much about the film’s value on its own merit but rather if it enchants you into a further instalment. I am a fan of these worlds and their characters, at the film’s climax I edged towards interest in a further instalment but caution and a reigning in of the unnecessary, must be taken in order to ensure I remain fully under its spell. The Crimes of Grindelwald is on general release now.